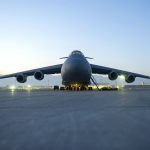 One of the largest military transport aircraft in the world, Lockheed-Martin’s C-5 Galaxy can transport a little less than half a million pounds of cargo and people. 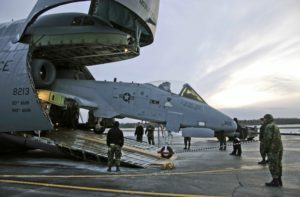 It’s one of the only transport aircraft that can move five Apache helicopters in its cargo bay. 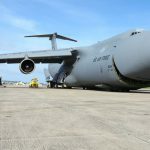 The C-5 Galaxy is considered a strategic air asset in that it can move an extreme amount of vehicles, equipment, and personnel nearly anywhere in the world. One of its unique features is cargo loading through the nose versus through the back — opposite of the C-130 Hercules. This enables the C-5 Galaxy to load extremely cumbersome, awkward payloads. 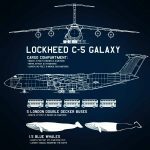 Infographic created to showcase C-5 Galaxy. 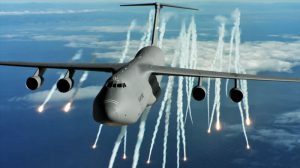 The C-5 Galaxy has pushed the envelope in what is capable with strategic air lift. Much like the Antonov An-225, this aircraft requires a lot of maintenance to stay in the sky. When it lands it requires 28 wheels, five sets of landing gear, and a runway length of over a mile. 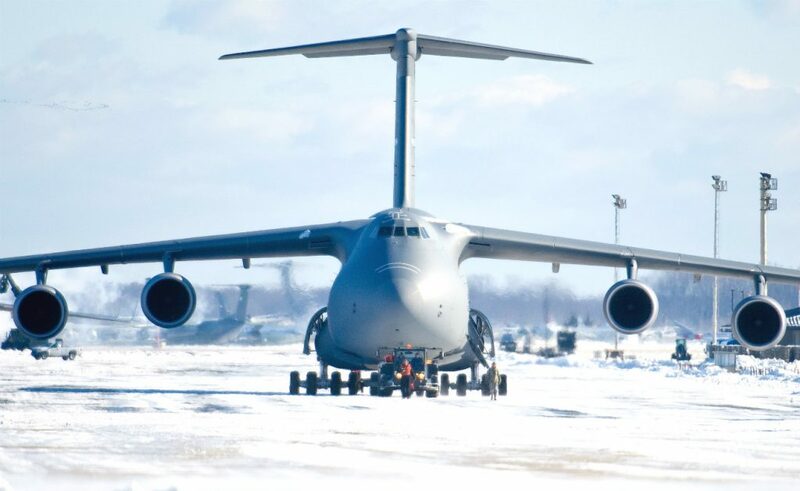 Because cargo is loaded through the nose, the C-5 relies upon its front landing gears to kneel. This kneeling has been the source of numerous malfunctions. There is an incredible amount of weight on those front landing gears, resulting in hydraulic issues. The most valued feature of the C-5 Galaxy is its cargo hold. Measuring roughly 13 feet high, 19 feet wide, and 143 feet in length, it has been used to carry everything from tanks to Intercontinental Ballistic Missiles (ICBM). 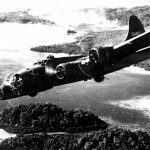 In 1974, the United States Air Force airlifted an ICBM and then dropped it out the back in the middle of the Pacific Ocean. The ICBM fell in free fall and then kicked on its rocket in time to ascend to altitude. This was a test by the Air Force to see if it was possible or even practical to launch an ICBM out of the back of an aircraft. 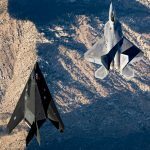 The Air Force proved it could be done but has since decided that, in practice, it’s not safe. Despite being in service since 1968, there are very few C-5 Galaxies in service. As of 2016, the Air Force reports that there are only 58 C-5B/C/Ms and 26 C-5A Galaxies. 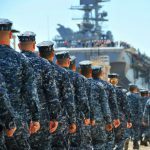 There are plans to reduce that fleet by three in the coming years. 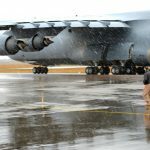 Between its extreme size and limited numbers, repairs and maintenance for the C-5 have been problematic. 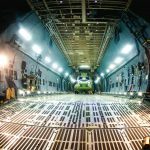 It’s often reported that finding parts or having a maintenance area available for the aircraft has been in the forefront of setbacks. 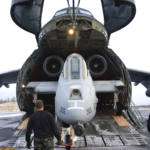 The C-5 Galaxy unloads an A-10. 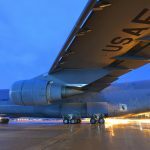 Because of ongoing issues relating to this big bird, the United States Air Force spearheaded a Reliability Enhancement and Re-engining Program (RERP) to enable the C-5 to survive until a projected 2040 date. This has required significant upgrades to both the engines and other mechanical systems. The latest version of the C-5, the C-5M, is the result of this program. The C-5M features newer engines and an enhanced avionics deck. 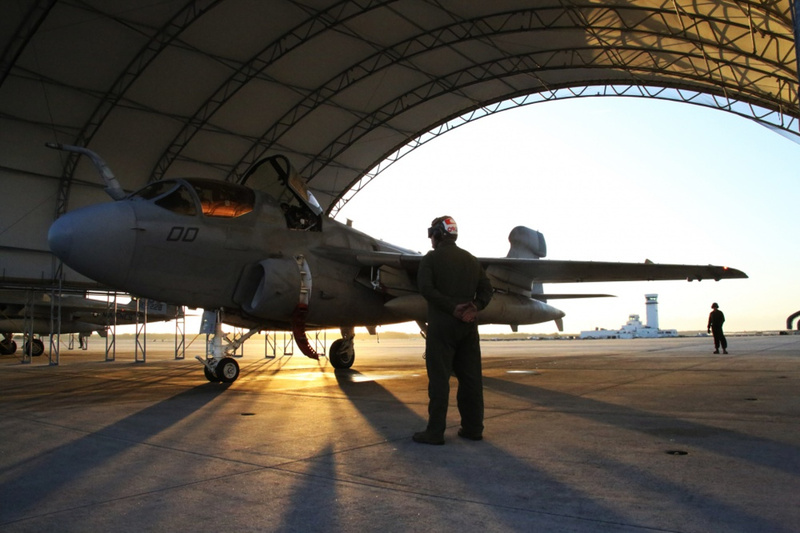 It’s also a lot quieter to keep up with FAA Compliance requirements. 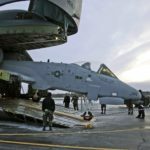 Even with the upgrades, the entire fleet of C-5s has not all been touched. 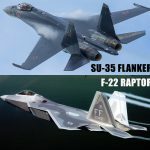 According to the United States Air Force, of the 78 current C-5s in existence, 26 are still C-5As and the remaining 58 are in some phase of transition between B/C/M variants. 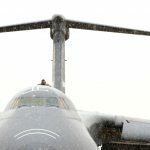 Team Dover aircraft maintenance personnel tow a C-5M Super Galaxy down the flight line Jan. 3, 2014, at Dover Air Force Base, Del. The tow team crew pushed the aircraft out of the wash rack hangar after the snow storm passed. The C-5 Galaxy is powered by four General Electric TF39-GE-1C turbofans. Each turbofan is capable of generating 43,000 lb-ft (190 kN) each. See more captivating images of the C-5 transport aircraft.